Then, after you mix and roll your crusts, you add whatever filling you want (pumpkin, apple, etc). You wrap them well, and you freeze them. This is exactly how Sara Lee does it. Only she puts hers in a box. We’ll skip that part. This post is chuck full of pie-making tips, recipes, and instructions. Shall we begin? Place flour, salt and shortening in food processor. Drizzle in the water while the food processor is still whirling. Continue until a ball of dough forms. Roll out your dough into a circle on a well floured surface. Place your dough in your pie dish with the folded corner in the center. Poke your dough a few times with a fork to keep it from poofing up in the oven. Bake at 450° for 10-12 minutes or until the crust is golden brown. Or, fill it with pie filling and bake as directed in specific pie recipe. 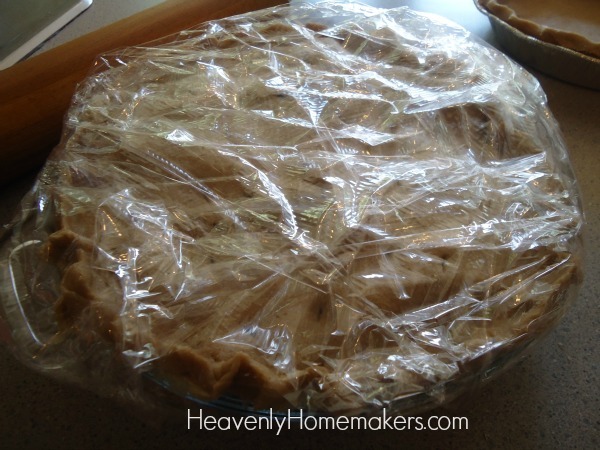 You can look through a picture tutorial on this post to see the specifics of how to roll a pie crust and place it in a pie pan. To make a frozen pumpkin or fruit pie, make it according to the directions but do not bake. Wrap the unbaked pie very well in plastic wrap. You might even consider putting the wrapped pie into a freezer bag for extra freezer protection. Label the pie. Freeze for up to three months. To bake your frozen pie, take it out of the freezer and put it directly into a cold oven. Turn on the oven and bake as directed allowing a little extra baking time if necessary. See how easy this is?! If you plan to make a cream pie, bake your crust as directed, allow it to cool, then wrap and freeze. Thaw crust and add your cream filling before serving. Whisk together all ingredients. Pour into unbaked pie crust. Freeze if desired. Bake at 350° for 50-60 minutes, or until a toothpick inserted in the middle of the pie comes out clean. Wash and slice apples. Stir in sucanat and cinnamon. Make a double pie crust recipe. Place one crust on the bottom of a pie pan. Spread apple pie filling into the unbaked crust. Place the second pie crust on top. Seal and shape as shown in the video above. Freeze if desired. Bake at 350° for 50-60 minutes. I usually have prepared Apple Pie Filling in my freezer, making this super simple. Make as directed above, only make a single pie crust. Top apples with crumb topping recipe found here. If you’re hoping to Get Ahead for the Holidays, I highly recommend making your pies soon and putting them into the freezer to pull out for easy baking the day before your meal! Thanks for the information. I want to do this! Thank you, I never knew how to freeze pumpkin pie , this is awesome! Oh. That sounds yummy. And easy. Loving it! I am so glad you are doing this series. Please clarify for me(I’m a bit slow at 3:45am), I make the filling–pour into unbaked crust–wrap really, really good–freeze, correct? Thanks! I am not much of a pie maker, but my husband is. I might try this sometime! This sounds great. Homemade pies beat store-bought any day! Such a great idea! I will try this and let you know how it goes! You must be way more dexterous (?) than I. I can’t imagine wrapping (well!) an unbaked pumpkin or sweet potato pie. Half of it will be on the floor on my way to the freezer, and the other half will likely be dribbling all over the other frozen foods once I get it in there. Do tell how you accomplish this miraculous feat. I am planning on make ahead mashed potatoes, rolls, and desserts. Now I’m excited about Thanksgiving, otherwise known as the day that mom cooks and cleans all day long while everyone else watches football. Still grateful. I was thinking the same thing! My deep freezer is 30 feet away, down 3 steps. There will be pumpkin all over everything! That Dutch Apple Pie is calling my name…. I love this idea! Thanks for these holiday sress-savers!!! 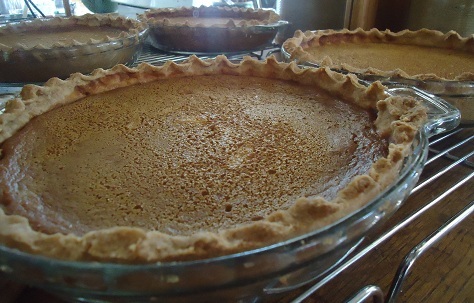 Cathie – I intend to put my pumpkin pies (one with a crust and one without for the grain-free eaters) on a cookie sheet to freeze and THEN wrap it securely. Love making and freezing pie. It is just as easy to make two or three and freeze some. This will help me a lot this year. Great post. Thanks! Thank you for the information! I would love to win one of the gift certificates. Thank you. Oh yum! If only someone would make crusts for me. I can fill all day, but can’t figure out the crusts. I’ll definitely be trying yours! Thanks Laura. I’m with Cathie, though. I don’t have high hopes for my ability to wrap up a pie with liquid-y filling like pumpkin. I’m doing good if I can carry it from the counter to the oven without losing half of it! This seems simple enough. Thanks! Question… do you usually cover the edges of your crust with foil when baking? B/c i find w/filling that is liquid, that step can be quite a bother/hassle, and just don’t do it anymore, I have found that crust is just fine if I leave it be. Here’s my recipe for Pecan Pie, and yep, it can be frozen! This will definitely help. Hubby’s been after me to make an apple pie for Thanksgiving. Thank you! I like making pies just can’t get one to turn out pretty. My mom and sister are so good at pies. I missed that gene. Can bake just about anything else–just not a pretty pie. Although my kids don’t complain. They don’t even know what a pretty pie looks like! As long as it is pumpkin with lots of chopped pecans on top, they are happy campers. Will have to try the freeze ahead–don’t have to eat so much pie at one time now either. This will make holiday dessert prep so much easier! Thanks for the tips and recipes! Good ideas! 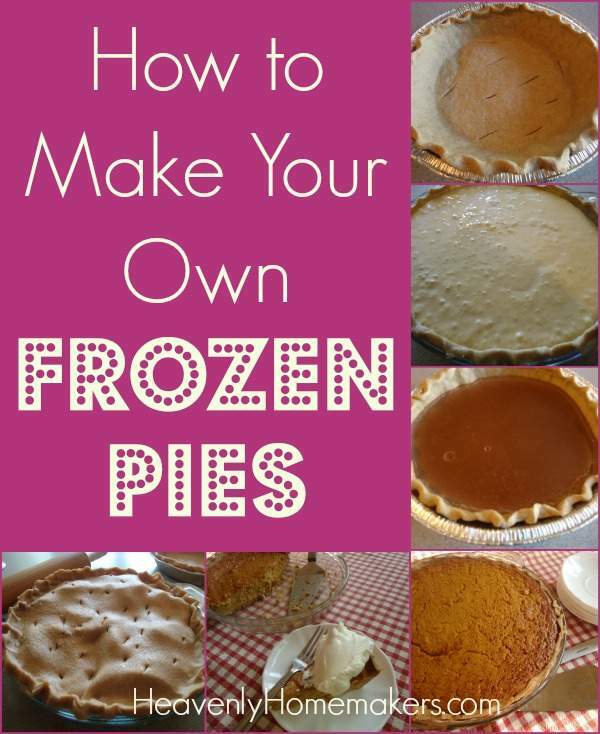 I have never tried making my own frozen pie, but I should try it sometime. Thank you! I am so excited to start making my own frozen pies. Who knew it was so easy. Thanks Laura. I’ve been freezing my baked pumpkin and pecan pies for years. They always taste fresh, and it sure saves time during the holidays. I am so excited about making pies! I just got my nutrimill and can’t wait to make pie crust healthy!!! Thank you for the how to and encouragement. My MIL asked me to bring an apple pie this year. Can’t wait to try out this one! Love that second paragraph…my sentiments exactly! Never thought about freezing pies ahead of time. Thank you! Thank you for this about the pies.Making food ahead of time is such a time saver. The pie crust recipe is one of the worst I have ever tried. This is no fault of Laura’s. Some things just should not be made with whole wheat. Pie crust is one of them (yellow cake and pizza crust are included). I used hard white, freshly ground whole wheat and palm shortening. There was zero flavor and the crust was barely flaky. On the upside, it rolled out fine. Perhaps whole wheat pastry flour would work better? We hardly ever have pies, so I am going to stick to good, old white flour for the world’s best pie crust. Bummer it didn’t work for you! I never have trouble with mine being flaky, even with hard white wheat. But trying ww pastry flour is a great idea!